Do you like following the latest decorating trends? Or are you more like me? You kinda slide into them while you’re discovering your own personal style? Some trends tend to hang around for years and some vanish before they really even get started. To me it means I should only grab onto those ideas I love. Even though it’s fun to explore some far out ideas at times I’m not going to spend much money on them. We have a red sectional sofa in our den that was the first new furniture we had purchased in years. YEARS. 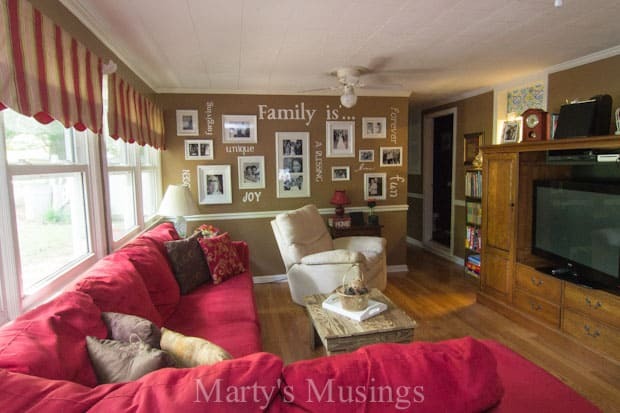 When you have lots of kids and pets and live on one income your decorating style is called shabby. Yes, shabby. There was no “chic” in that style! Anyhoo, we bought the red sofa on sale straight off the showroom floor, borrowed a pickup truck to haul it home, lugged it up the driveway, over the fence, squished it through the back door and into the den. Are you picturing it with me? There might have been a few choice words said. 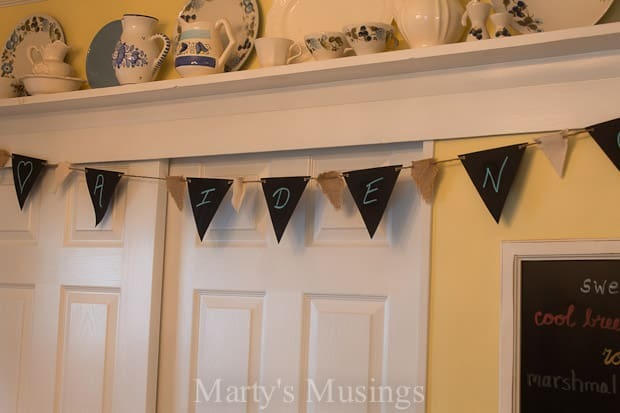 Believe it or not, this was at the very beginning of our DIY days on the blog and the first glimmers of Marty’s Musings being anything other than a little family journal. Now where was I going with that story? Right, something about decorating trends. We’ve had that red sectional for almost four years and I still love it. It’s well made and has withstood teenagers, grown kids, great nieces and nephews, dogs, cats and now a grandson soon to be crawling all over it. My simple point is you need to go with what you love not just the latest trend. Maybe those two ideas will collide and maybe not. Now let me show you how I’ve taken the chalkboard trend and incorporated it into my home. 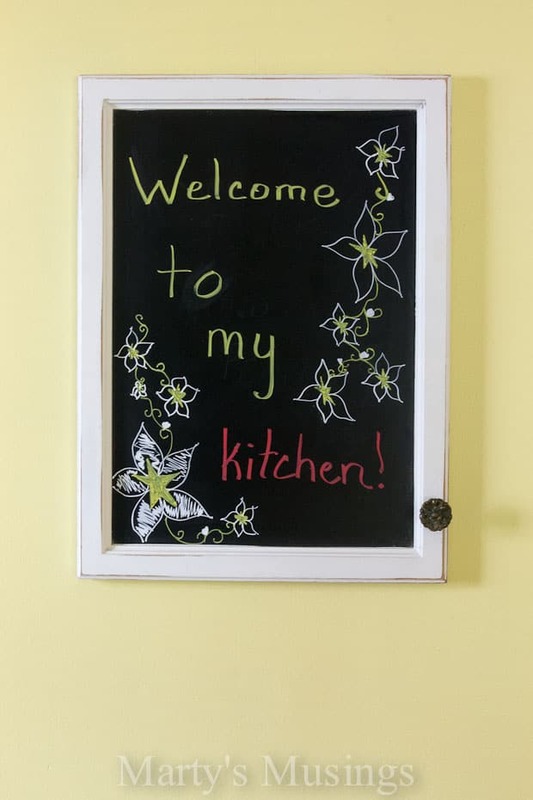 If you’ve had your head stuck in the sand not been on Pinterest lately (find me here) one of the current trends still making its way around the home decor field is the use of chalkboards and chalkboard paint. 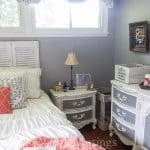 Although this is not a new trend there is still a proliferation of chalkboard paint ideas floating around the internet. 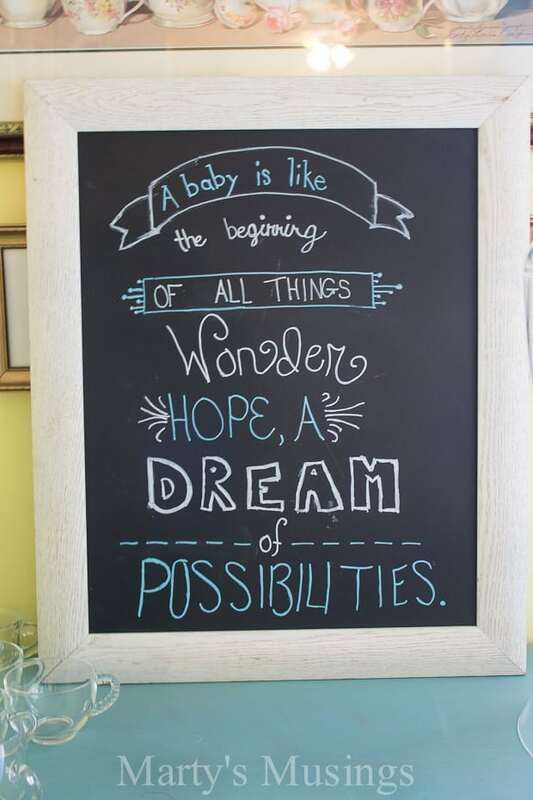 Just search Pinterest with the keyword chalkboard and you’ll have inspiration for days! Once only used for the typical school classroom, chalkboards can now be seen in everything from magazines to department stores and restaurants. 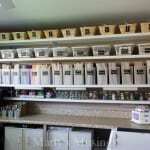 Many department stores and retailers, as well as online vendors, carry the latest in home decor products. 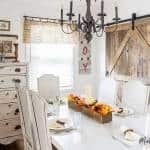 You can easily find baskets with wooden chalkboard labels, chalkboard doors to lean against the wall for a shabby chic look and rustic flower buckets with labels. I have a framed chalkboard I hang in my kitchen to write inspirational quotes on or birthday and seasonal greetings. For this specific project I simply spray painted a discarded mirror from a bathroom remodel. 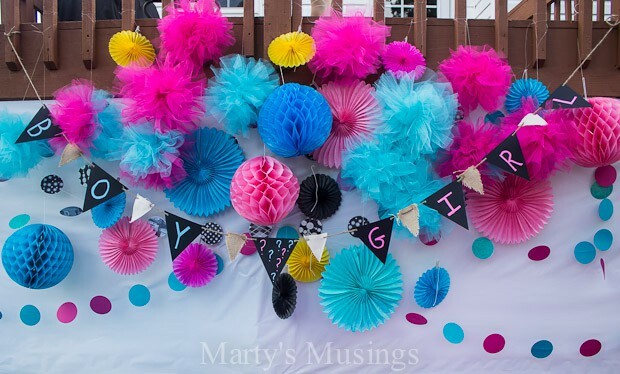 Cute, easy and inexpensive! If your walls aren’t permissible for decorating you might want to look at your furniture. 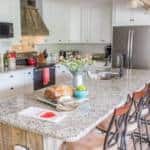 Spend a few minutes perusing the internet and you might find a table, filing cabinet, dresser, shutters, doors or even a refrigerator painted and ready to go! If you don’t want to experiment with furniture grab an old window off the street (or from a construction site like my husband did) and paint the panes. 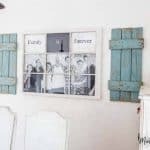 This favorite DIY project of mine is the art in my craft room. 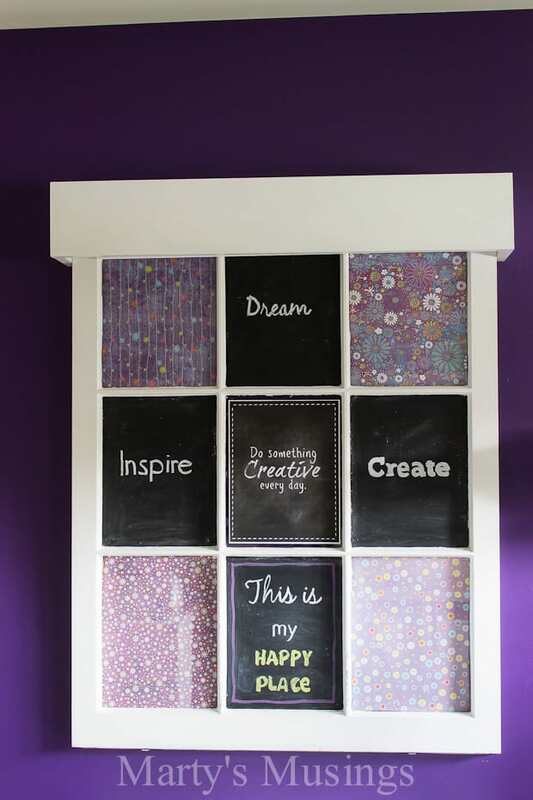 By using both patterned scrapbook paper and chalkboard painted panes I have a one of a kind piece that echoes the creativity in my studio. You can order labels or tabs already cut out and ready to add your personal categories or you can even DIY your own with a bit of scrapbook paper and a paper punch or diecutting machine. 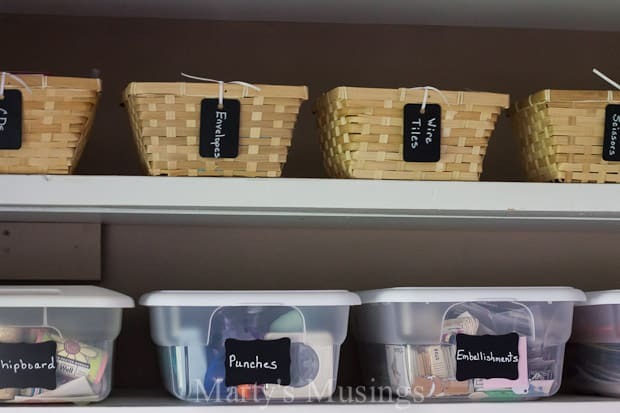 When I reorganized my craft room I labeled practically everything, including baskets, tubs, drawers and boxes. 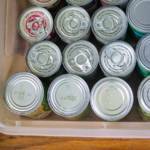 Need a creative way to keep track of your grocery list? 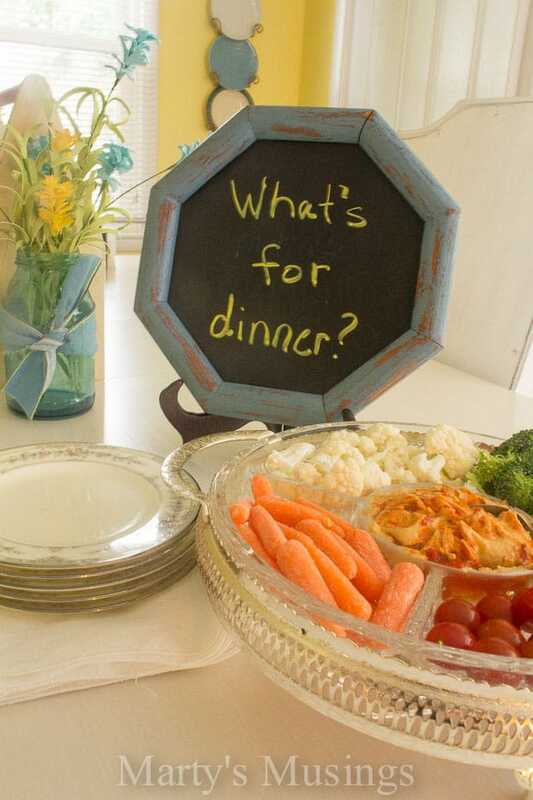 Write it on a chalkboard or use a shabby chic frame to answer the kids’ question of what’s for dinner. One of my favorite party accessories is this $1 framed chalkboard I bought at a yardsale. I use it at every party and usually persuade my youngest daughter to draw on it for me. I even use it for seasonal displays. 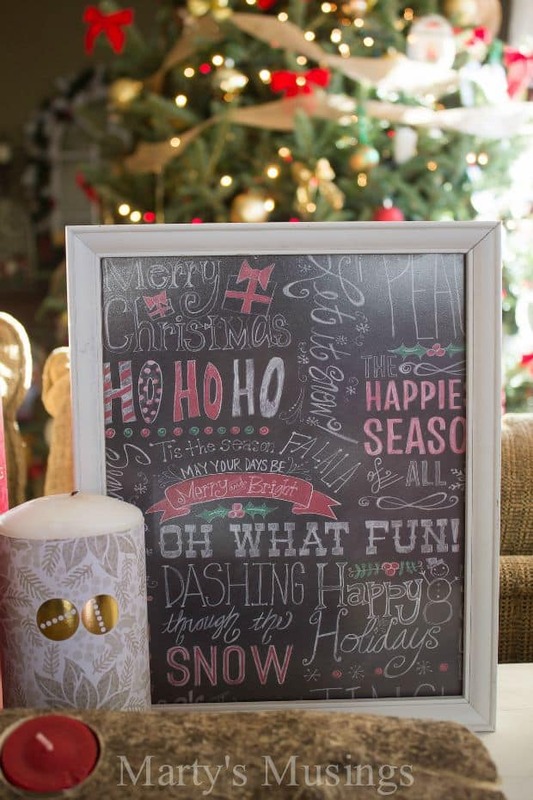 If you don’t want to go to all the work of chalkboard paint you can simply buy some chalkboard scrapbook paper and cut it to fit a dollar store or yard sale frame. 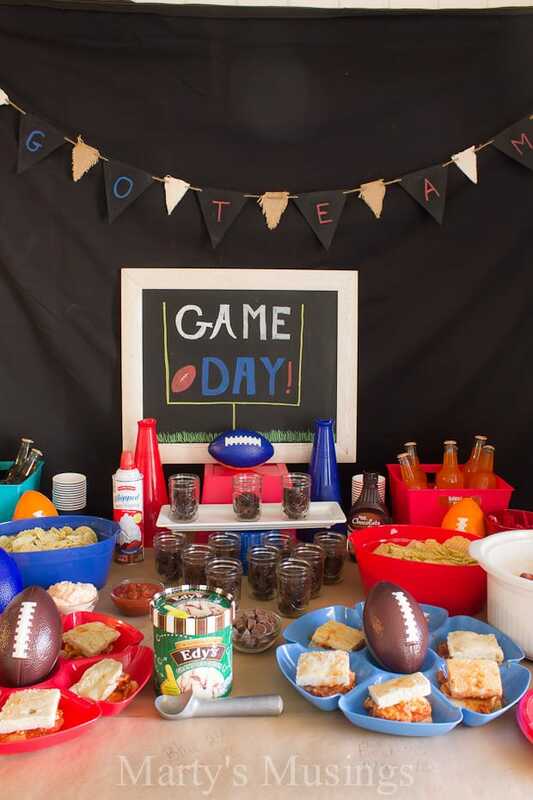 and Super Bowl party. 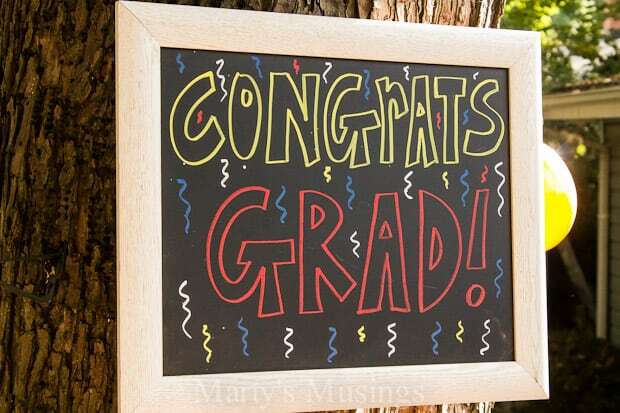 This banner is the best accessory to have on hand for celebrations! 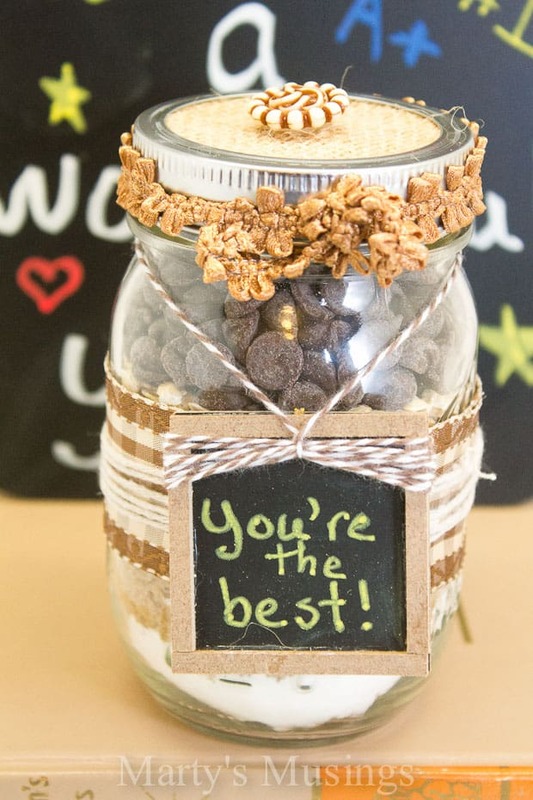 Aren’t these the cutest little chalkboards you’ve ever seen for a back to school (or end of the year) teacher’s gift? 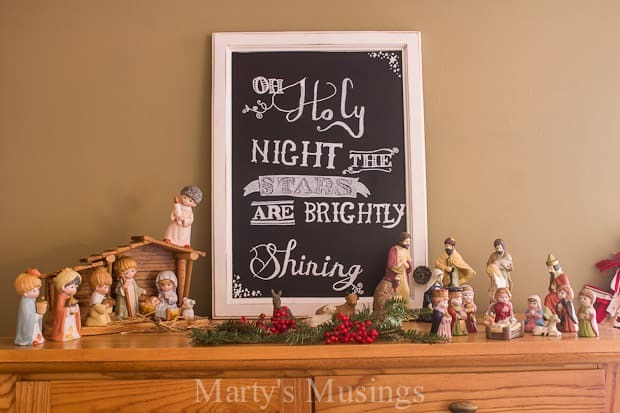 Chalkboard paint comes in a multitude of colors, in both spray and brush on and can be drawn on with chalkboard markers or you can use regular chalk in white or colors. 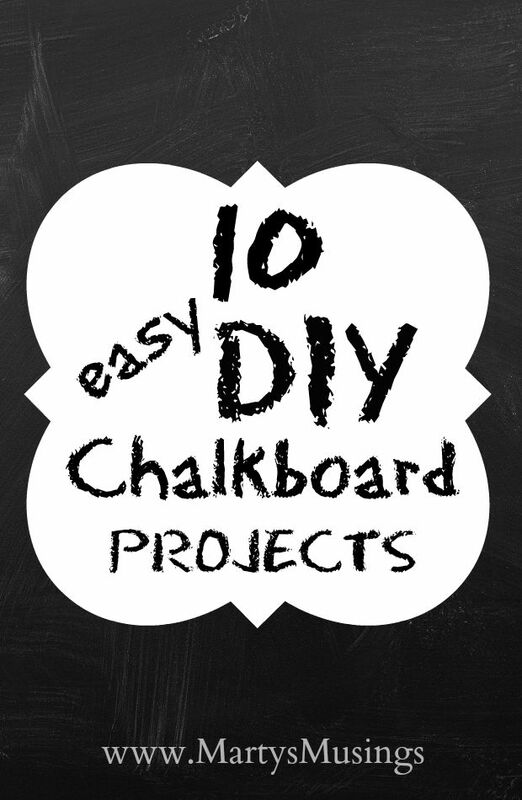 Have I given you any ideas to persuade you to jump on the chalkboard bandwagon?